Post jobs to multiple job boards with one click! CBCJobs provides recruitment services to some of the largest companies in the world. How is CBCJobs better than other job boards? We have metro area search. Users can click on areas such as Los Angeles, or Miami, and immediately see listings. Our free basic resume search is here. We get a whole lot of visitors and have nationwide reach. We get thousands of visitors daily, from all corners of the United States. And these visitors are not annoyed by ads all over the place, or a slow loading site. They also convert to job applicants at a higher rate and, on average, fit the job better. - Most job boards are overloaded with graphics and various other content, which results in slow loading times. Our site is optimized and loads fast! Many job boards have annoying ads all over the place. We have very little advertising. How is CBCJobs better than Craigslist? - we have high level candidates that do not visit sites like Craigslist. The quality of the applicants on our site is much higher. We have an applicant tracking system. No more email clutter! 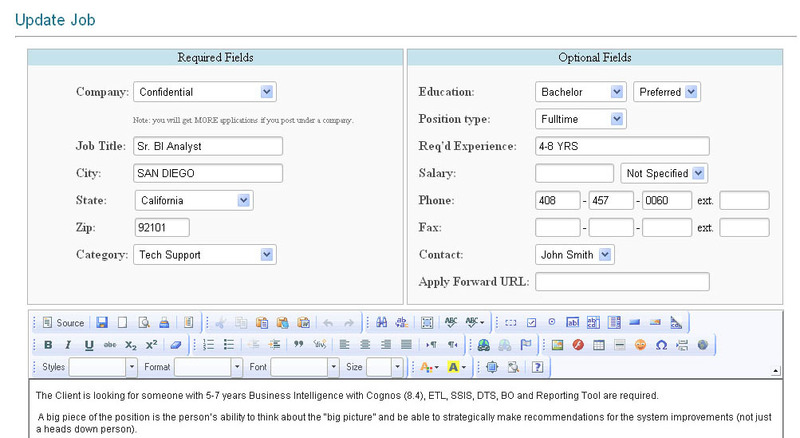 All candidates are neatly stored in a database, which can be retrieved/viewed at any time. with CBCJobs, you can create a company page and post jobs under this company. we are corporate friendly. All jobs are neatly stored in your account, as are all the candidates. All information is searchable and easy to access.